Shape : Cushion Cut. 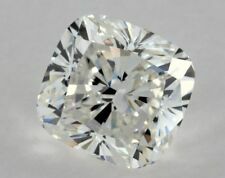 Carat Weight : 2.11 Ct. MM Size : 7.54 X 7.54 X 4.84 mm. Brilliance/Refractive Index: 2.65 ( Better Than Mined Diamond's 2.42). The Side stone is simulated diamonds. These diamonds are in every respect like natural diamonds except hardness. Shape : Cushion Cut. Carat Weight : 1.75 Ct. MM Size : 7.25 X 6.99 X 4.64 MM. Brilliance/Refractive Index: 2.65 ( Better Than Mined Diamond's 2.42). The Side stone is simulated diamonds. These diamonds are in every respect like natural diamonds except hardness. Shape : Cushion Cut. 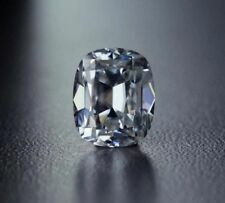 Carat Weight : 1.96 Ct. MM Size : 7.51 X 7.44 X 4.79 mm. Brilliance/Refractive Index: 2.65 ( Better Than Mined Diamond's 2.42). The Side stone is simulated diamonds. These diamonds are in every respect like natural diamonds except hardness. Jewelry also can be done in 925 Sterling Silver / 935 Argentium Silver. All cuts are man-made and polished in own factory. It has finest brilliance and fiery look. Shape : Cushion Cut. Carat Weight : 2.31 Ct. MM Size : 8.32 X 8.15 X 5.06 MM. Brilliance/Refractive Index: 2.65 ( Better Than Mined Diamond's 2.42). Color : Green. Cut: Excellent. We believe in giving high qualityproducts at the best rate in the world, so that every person can approach it & make it their Dreams to Wear our jewellery. products at the best rate in the world, so that every person can approach it & make it their Dreams to Wear our jewellery. We also make a customized shape. Shape: Cushion Cut. Color: Orange. Total Carat Weight: 29.92 Carat. Clarity : VVS1. Shape : Brilliant Cushion Cut. Carat : 2.15 Ct. Color : White G-H. We keep you updated regarding the status of your order. Cut and created with every single aspect in mind. She is sure to love it as much as she loves you. Charles & Colvard Warranty. by Charles & Colvard 2.65-2.69 0.104 9.25 Excellent. MM: 7x5 mm. Category: Forever Classic. We also make a customized shape. Color: Cognac Brown. Shape: Cushion Cut. Total Carat Weight: 18.14 Carat. This beautiful 11 piece set of green moissanite stones weighing 5.5 carats is ready for your favorite settings. Cut and created with every single aspect in mind. She is sure to love it as much as she loves you. Charles & Colvard Warranty. by Charles & Colvard 2.65-2.69 0.104 9.25 Excellent. In cleavage direction, toughness is "good". We also make a customized shape. Color: Cognac Brown. Shape: Cushion Cut. Total Carat Weight: 20.68 Carat. Stone Shape: Cushion cut. Color: G-H-I. Condition: New. FOREVER ONE ! Includes Certificate of Authenticity from Charles & Colvard - Forever One. Each Jewel is micro Laser Inscrided by Chalres & Colvard on it's girdle with "Forever One". Forever One. Charles and Colvard “CERTIFICATE OF AUTHENTICITY & WARRANTY” Included. Item must be in its original unworn condition. Color can be slightly different due to reflection of light in the picture. Item must not have been sized or customized in any way. ALL PAPERS and gift box must be included and in new condition. Cushion Brilliant. - MANTRA JEWEL. Carat weight -:-. · MOST OF THE DIAMOND TESTER WILL EVEN SHOW IT AS THE DIAMOND BECAUSE OF 9.25 OR HIGHER HARDNESS ON MOHS SCALE. STONE SPECIFICATION :-. · We are the direct sources of Diamond in Surat (India). GHI Color - VS1 Clarity. The process is lengthy, complicated, and expensive, which limits the output (it takes 2-3 months for the creation of a single gem). View our shapes and sizes charthere. New From Charles and Colvard. This massive gem is perfectly eye-clean, with no inclusions. Weight : 11.22 carat. with good fire, and a diamond equivalent weight of 13.20 carats. and would make a stunning jewelry piece mounted in a nice setting. We also make the customized shape. Color: DEF white. Shape: Cushion Cut. Total Carat Weight: 1.00 Carat. Stone Shape: Cushion. 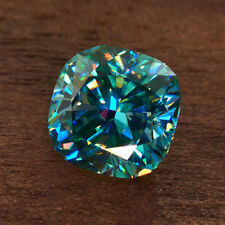 Stone Carat Weight: 0.35ct. The process is lengthy, complicated, and expensive, which limits the output (it takes 2-3 months for the creation of a single gem). View our shapes and sizes charthere. New From Charles and Colvard. Color: Off White ice blue. Shape: cushion Brilliant Cut. Hardness: 9.25 on Mohs scale. Cut Grade: Excellent.